Northwood’s Head Office was based in Southampton and needed to relocate to a new facility that would take forward the campanies profile in the market place and be a warm and receptive workplace for both staff and company visitors. Northwood chose Hampshire Mezzanine Floors to fit out their new Head Office based in Cams Hall, Fareham. The location chosen was the listed main barn in the prestigious Cams Hall site with a wooden framed high roof and old clay tiles. The brickwork was beautifully crafted and the barn retained all of its original charm. Northwood wanted to create a functional and efficient interiors refit that not only reserved the beautiful integrity of the current listed surrounding, but actually enhanced the asthetics and to make a feature of the original barn structure. 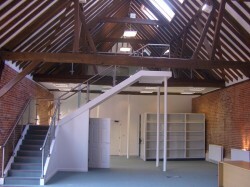 Hampshire Mezzanine Floors designed a gallery mezzanine floor supported off the existing wooden rafters of the building with additional tubular support columns to strengthen the existing roof trusses. Next came a brushed stainless steel ambulant staircase and balastrading to the mezzanine floor, complete with toughened glass throughout so the mass of the staircase and visibility from the gallery mezzanine, and the view up through the staircase and balastrading, enhanced the asthetics. Hampshire Mezzanine Floors then created new toilets, kitchen, training and meeting rooms, including a board room created from facetted architectural glazing with glass doors, creating good visibility as you look through the building and a hi tech modern feel to the area, contrasting beautifully with the ancient barn fabric of the building with the original old brick left exposed through the building. This brickwook was wall washed with subtle uplighting that enhanced the look of the brickwork as well as suspended lighting with only wire support from the roof. As Main Contractor, Hampshire Mezzanine Floors designed the complete mechanical and electrical installation with their sub-contractors, using modern and energy efficient lighting systems. Hamphsire Mezzanine Floors fitted a mobile shelving storage system for paperwork with conceiled floor track design to enable the new carpet tiles to flow through the area at the same time. This shelving also had end panels fitted to enhance the look of the shelving to blend with the surrounding. Hampshire Mezzanine Floors fitted several different types of flooring throughout the installation including non slip vinyl flooring in the toilet and kitchen areas, wooden plank effect flooring in a feature meeting area and heavy duty carpet tiles throughout the rest of the building. Gemma Goodson of Northwood advised “The Hampshire Mezzanine Floors team did a brilliant job on our barn. The project came in on time despite a tight schedule and now provides us with a beautiful working environment”.